US jet in emergency landing Jump to media player A JetBlue airlines A-320 flying over California has been forced to make an emergency landing when an engine problem caused smoke to enter the aircraft's cabin. Airbus: We learnt from our mistakes Jump to media player Airbus executive Kiran Rao has been giving more information about the new A350 plane and says the firm has learnt from its previous mistakes with the A380. First close-up look at Airbus A350 Jump to media player BBC reporter Puneet Pal Singh gets a sneak preview ahead of the Airbus A350 going on public display at the Singapore Airshow. 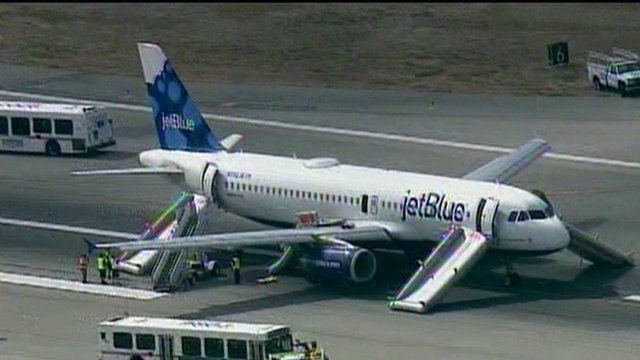 A JetBlue Airlines A-320 flying over California has been forced to make an emergency landing when an engine problem resulted in smoke entering the aircraft's cabin. Flight 1416 was bound for Austin, Texas, when it "declared an emergency" and returned to Long Beach Airport, according to the Federal Aviation Administration. Once safely on the ground the passengers, none of whom were hurt, were evacuated from the plane via emergency slides.